In this video I demonstrate a quick and simple way to remove plug-ins & sends when working in PreSonus Studio One Version 4.1.4 and above. In this video I demonstrate the 'Select Ranges On Tracks' function in PreSonus Studio One. More specifically what it does, and how it can be used to simplify editing automation when working. VCA’s (added in Version 3) were one of the biggest feature requests in PreSonus Studio One (especially from former Pro Tools users) In this 2nd video of a 2 part series, I demonstrate how to work with VCA's with respect to automation. More specifically, how to render VCA Automation into source tracks - as well as how to merge VCA Automation (static offsets) when needed. VCA’s (added in Version 3) were one of the biggest feature requests in PreSonus Studio One (especially from former Pro Tools users) In this 1st video of a 2 part series, I demonstrate the basics of VCA's - more specifically how to set them up, what they do, and why they're so incredibly useful. Using Reference Tracks is a great way to maintain objectivity when mixing - but it can also be a huge pain unless your routing is set up to accommodate. In addition - did you know there is a preference in Studio One that can help when A/B ing between your mix and your reference track(s)? In this video I demonstrate how to edit adjacent MIDI Notes (AKA Legato phrases) in PreSonus Studio One - essentially allowing a user to move the beginning and ending position of 2 MIDI notes at the same time. In this video I demonstrate how to export Raw Audio tracks (Regions) in PreSonus Studio One 4 using a Drag & Drop workflow from the Arrange Window to the Browser. In this video, I wanted to dig down a little further into some of the questions and comments I received from last weeks video "Tracks vs Channels - Exporting Stems In PreSonus Studio One”. So essentially - a Q & A Video Response. The 'Export Stems' option in Studio One is an extremely useful way to quickly render out Stems from your Song. But did you know that there are some fundamental differences between using Tracks vs Channels? In this video, I demonstrate the key differences between the 2 methods - as well as when (and why) to use one method over the other. In this video I demonstrate how to export Audioloops with Embedded Chord Track Metadata In PreSonus Studio One 4. In this video, I demonstrate how to stretch Audio Files (Loops) using 'Define Tempo' vs the traditional 'Stretch Event' approach. Define Tempo is a unique approach to use when timestretching Audio Events which (in some cases) may be preferable to use vs basic timestretching. In this video I demonstrate the 'Automatically Add Envelopes For All Touched Parameters' automation preference in PreSonus Studio One. More specifically when (and why) to use it - and how it interacts when writing plug-in automation. In this video I demonstrate a workflow that can be used to remove Tempo Metadata when using a drag & drop workflow to export One-Shot Audio Files via the Studio One browser. In this video I demonstrate the main differences between Track Based Automation vs Part Based Automation (a.k.a. Region/Event Based Automation) when working with Instrument tracks in PreSonus Studio One. In this video I demonstrate a couple miscellaneous tips that can be used when working with The Chord Track in Studio One Version 4 with both Audio Events, and Instrument Parts (MIDI Events). In this video I demonstrate how to utilize Folder Tracks and Various Console View Options to help maintain a neat & tidy Arrange Window when working in PreSonus Studio One. In this video I demonstrate how to set Studio One's preferences so that an Automation Track is automatically created for Bus Channels, FX Channels, & VCA Channels when using PreSonus Studio One. For those coming from other DAW's such as Pro Tools, this may be preferable to the default behaviour. In this Studio One Quick Tip video I demonstrate how to select multiple pads in Impact XT in Studio One Version 4.1.1 & above. This can be extremely useful when adjusting the outputs of multiple pads at once (in addition to other parameters). In this Studio One Quick Tip video, I demonstrate how to quickly Rename Audio Events & Instrument Parts (MIDI Events) To Match Track Names In PreSonus Studio One. Picking up from where we left off in last weeks video - In this 2nd video I demonstrate some of the more advanced workflow concepts of the amazing Manual Tempo Mapping Improvements that were added in the Studio One V4.1.1 update. In this video I demonstrate the basic workflow of the amazing Manual Tempo Mapping Improvements that were added in the Studio One V4.1.1 update. In this video I demonstrate a workflow that can be used to generate instant 808 Bass Lines (Borrowed from The Kick Track's MIDI) using The Chord Track in Studio One Version 4. In this Studio One 4 Quick Tip video, I demonstrate how to go about using the Invert Selection option when editing. In addition, I also take a look at how it can be used in tandem with some of the new Note Selection Musical Editing Functions in Studio One 4. If you’ve ever found yourself in the position where you’ve wanted to somehow get the Tempo Map from an audio file into the Studio One Tempo Track - then this one is for you.. In this video I demonstrate how to extract a Tempo Map from Audio Events in Studio One Version 4.1 and above. In this video I demonstrate how to go about creating custom Note FX Chorder Presets from MIDI Events (Instrument Parts) in PreSonus Studio One. In this video, I demonstrate how to generate song ideas for your productions using the stock Repeater Note FX Plug-In in Studio One 4. Although version 4 was used in this video, this tutorial applies to Version 3 as well. In this video, I demonstrate how to add movement to your productions using the stock Arpeggiator Note FX Plug-In in Studio One 4. Although version 4 was used in this video, this tutorial applies to Version 3 as well. In this video I demonstrate the differences between Time-Linear vs Beat-Linear Timebase Settings in Studio One 4.1, as well as the updated Tempo Ramp abilities. In this video I demonstrate how to create a Macro in Studio One 4 that will automatically help gain stage your virtual instruments when needed. In addition, I also outline some other workflow benefits to using a Macro vs manually adjusting the global output volume on VI's. In this video, I demonstrate how to go about rendering any changes that were made by The Chord Track into Instrument Parts (otherwise known as MIDI Events) In Studio One 4. In this video, Marcus Huyskens demonstrates the new advanced Quick APT/Quick Doubler Studio One integration for users of Revoice Pro 3.3 and Studio One 3.3.4+. In this free video tutorial, Marcus demonstrates a workflow for quickly and accurately aligning drum samples to source tracks in PreSonus Studio One. In this free video tutorial, Marcus Huyskens demonstrates how to use the 'Slow Down' parameters in Waves Abbey Road Vinyl to emulate the infamous tape stop effect heard on countless tracks. In this quick tip video, Marcus Huyskens demonstrates how to import a tempo map from a MIDI file into PreSonus Studio One. In this free video tutorial, Marcus Huyskens demonstrates how to achieve a perfect Parity between the arrange window & the console when working with Mult-Out VST's such as EZ Drummer, in PreSonus Studio One. 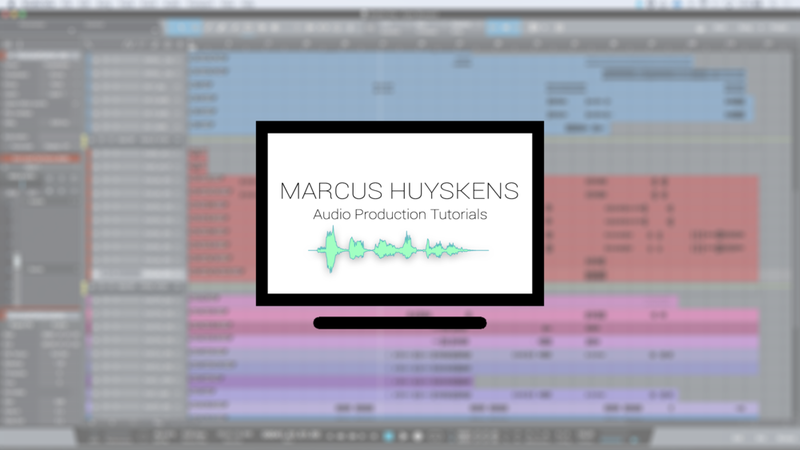 In this video, Marcus Huyskens demonstrates how to do a horizontal timeline 'Drag & Drop' with Audio Events in PreSonus Studio One. In this free video tutorial, Marcus Huyskens continues with the 3rd video of his "into the pocket" series. In this video, he demonstrates how to achieve a 'Beat Detective' style drum slicing workflow, when quantizing multitrack drums to the grid in PreSonus Studio One. Marcus follow's up from his first video in this mini series titled "Into The Pocket". In this free video tutorial, he demonstrates a workflow that can be used when combining multiple loops & samples, by augmenting their timing, and quantizing them to the groove clipboard. Marcus begins with his first video in a mini series titled "Into The Pocket". In this free video tutorial, he demonstrates a workflow for tightening up kick & snare samples to sit better with loops, by quantizing them to the groove clipboard. In this video, Marcus demonstrates how to use the drag & drop "Replace Event" option that is available while using the browser in Studio One. In this video, Marcus demonstrates a workflow that can be useful when trying to create seamless loops in Studio One. In this free video tutorial, Marcus demonstrates an alternate workflow when using iZotope RX within Studio One. This workflow involves working off of a bounced from within the pool, and updating the event in Studio One, as opposed to using Event FX, and traditional export options with RX. In this free video tutorial, Marcus gives an in depth overview of how to use the "Match EQ" option within Fabfilter Pro-Q2. FabFilter Pro-Q 2 is designed to help you achieve your sound in the quickest way possible. Via the large interactive EQ display, you can create bands where you need them and select and edit multiple bands at once. Subscribe For Tips Tricks and More!